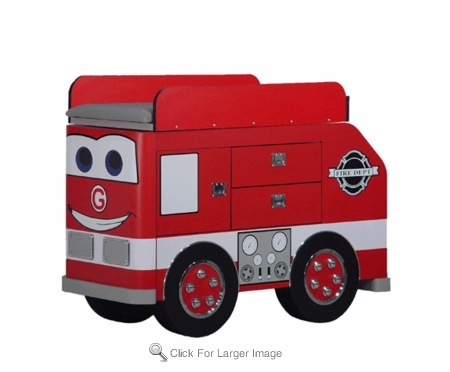 Speed through your emergency with Frankie Fire Engine. You will love the quick and easy access to your supplies in the two full extension drawers with flush mounted chrome handles. You can also store a full case of diapers in the large front cabinet. The back end is large enough to hold a diaper genie and a trash can. The top is three sided and comes with a 2" thick foam pad with a antimicrobial naugahyde shell. It will remove and is easily cleaned. 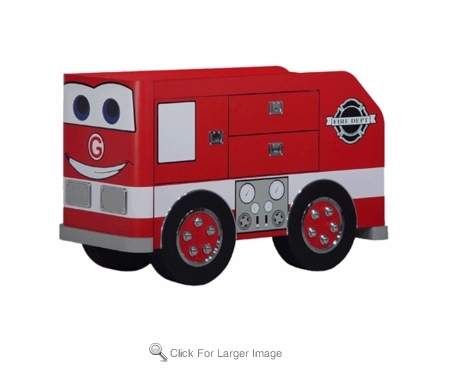 Dimensions: Height 40", Width 55", Depth 24"
THIS CHANGING TABLE IS CONVERTABLE TO A DRESSER. scroll down to see!! !